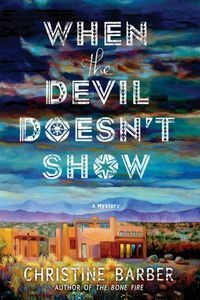 When the Devil Doesn't Show by Christine Barber: Synopsis and Online Purchase Options. Synopsis (from the publisher): A housefire leads to the discovery of not just the bodies of the homeowners, but also a third, unidentified corpse. The search for the man's identity will lead Detective Gil Montoya not too far from Santa Fe to one of its notorious but rarely discussed neighbors, the Los Alamos National Laboratory. A DNA test reveals that the unknown victim is a native of Northern New Mexico, but Montoya has reason to believe that his ties to the infamous nuclear testing facility hold the solution. And when a second housefire is found to contain more bodies, he's determined to find out the answer no matter the cost.